Rules for the Provision of Articles in the Publishing House "Food Industry"
The article is sent to the Publishing House along with a cover letter to Olga Petrovna Presnyakova, the editor-in-chief of the Food Industry Publishers, signed by the head of the institution where the work was done. When sending an article by e-mail, the letter should be sent in a scanned form, on a letterhead and with a signature. If an article dissertation, in the cover letter must specify the approximate date protection. The article should be no more than 10 pages in size in electronic form or on paper with an electronic carrier. The editors are not concerned with fine-tuning the articles to the required scientific, methodological and literary level. From February 1, 2015 the decision of the Redsovet is to check all articles for the volume of borrowings. A high level of incorrect borrowing serves as the basis for rejecting the article, which is reported to the author by e-mail. the list of references (at least 5 titles) should contain only those sources, references to which are in the text of the article, and in the order, as they are mentioned in the text. Links to unpublished works are not allowed. It is not recommended to refer to literature more than 10 years ago. The abstract should also meet the following requirements. In the beginning, the title of the article is NOT repeated. The abstract is NOT broken into paragraphs. The structure of the abstract briefly reflects the structure of the work. The introductory part is minimal. The place of research is specified to the region. The statement of results contains CONCRETE information (conclusions, recommendations, etc.). Allowed the introduction of abbreviations within the abstract (the notion of 2-3 words is replaced by an abbreviation of the corresponding number of letters, the first time is given in full, the abbreviation is in parentheses, then only abbreviation is used). Avoid using introductory words and turns! Numbers, if not the first word, are transmitted in figures. You can’t use abbreviations and complex formatting elements (for example, upper and lower indexes). Categorically, insertions are not allowed through the "Symbol" menu, a line break character, a soft transfer character, automatic word wrapping. translation of the essay into English. It is inadmissible to use machine translation!!! Editorial translation does not provide! Instead of a decimal point, a period is used. All Russian abbreviations are transmitted in decrypted form, if they do not have stable analogs in English (allowed: WTO - WTO, FAO - FAO, etc.). In electronic form, the article should be presented in Word format, typed by the 12th size in 1.5 intervals in Times New Roman Cyr font (it is allowed to use the Symbol font for a set of Greek letters). The page numbering is in the upper right corner of the page, including the first page. Formulas must be typed in the format of the Math Type program. Graphs, diagrams must be represented by separate files in the Exel format. Schemes and photographs should be presented as separate files in jpg format (at maximum quality) or tif with a resolution of 300 dpi, at least 9 cm in size on the long side. Schemes may be submitted in the format of eps. One should avoid overloading articles with a large number of formulas, duplicating the same results in tables and graphs. The cost of publishing preprinting of one article up to 10 pages (14 pins, interval 1.5) 5 thousand rubles. Articles in excess of 10 pages - 500 rubles. for 1 page. Articles of graduate students (without co-authors) are prepared for printing free of charge. 1. Prichko T.G. Biokhimicheskie i tekhnologicheskie aspekty khraneniya i pererabotki plodov yabloni [Biochemical and technological aspects of storage and processing the apple fruits]. Krasnodar, 2002, 172 p.
2. Skorikova Yu.G. Polifenoly plodov i yagod i formirovanie tsveta produktov [Polyphenols of fruits and berries and the formation of products color]. Moscow, Pishchevaya promyshlennost' Publ., 1973. 230 p.
4. 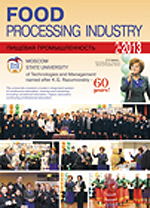 Dudkin M.S., Shchelkunov L.F. Novye produkty pitaniya [New food products]. Moscow, 1998. 204 p.
All articles submitted for publication in the journals of the publishing house "Food Industry" are reviewed for originality, ethics and significance. Reviewing of articles is the responsibility of the members of the editorial board, full members (academicians), corresponding members, as well as rectors, professors and associate professors of educational institutions, directors of scientific research institutes, research centers and their branches. Reviewing of articles, authors (co-authors) of which are persons, is conducted only with their consent. The procedure for selecting articles for publication in journals is carried out in two stages. At the first stage, the articles are reviewed by the editorial board for compliance with the requirements set out in the rules for authors. At the second stage, the contents of the articles are reviewed and reviewed by the relevant specialists. The period for submission of reviews by reviewers is 1 month from the day the article was submitted for peer review. The review of the articles is prepared by the reviewers in accordance with the form given in the appendix. Positive reviews are sent to authors only if it is necessary to finalize the article. Negative reviews are sent to authors in all cases. In the case of receiving reviews that require revision, the editorial staff directs this article for revision to the authors. Finalization should be carried out within the timeframe indicated by the editorial board. If the reviewer indicates that after the revision the article should be subjected to additional review, the revised article is sent for re-review. Articles that have received negative reviews in controversial cases can be sent for re-examination by additional independent reviewers. Additional reviewers perform peer review at the time specified by the editorial board. Articles that received two or more negative reviews are rejected. Articles that received one negative review are sent for revision to eliminate comments made by all reviewers. Completion is carried out by the authors in the terms established by the editors. After the completion of the article, the article is sent for reconsideration to all reviewers.